Each game is a cooperative session where a certain number of players can freely join and work together to win within a certain number of real world days. Presented in top-down Omnipotent-o-Vision, Leap Day is presented as an open field on which you can build if you have the cash and freely develop your kingdom. At the left is a panel of all the building options available and the gold you have. Just click an option, then click anywhere onscreen where you're given a green square to build it, using the "pickup tool" to reclaim it if you made a mistake. Leap Day is divided up into day and night cycles. Each day, Flans emerge from their homes and begin work. If their path passes by a resource like food or water, they'll snap it up and continue to your palace, where they'll sell it for gold you can use to build more things. At the end of each night, all resources replenish themselves. Since your basic everyday foraging isn't worth that much, however, you'll have to build factories. When placed, factories contain a number of receptacles, and passing Flan will drop whatever they're carrying in an open one. Find the right combination of raw materials and you'll unlock a recipe which the factory will begin crafting, allowing you to deliver these new, fancified goods to the palace for an even bigger payoff. Make sure to check your Recipedia (the little hammer icon) for a list of discovered recipes, as well as some clues to others. So far so simple, right? Well, here's the thing about Flans. They'll always proceed in a straight line, but if given a choice, they'll always turn right unless they can't, in which case they'll turn left. They won't turn around, they won't stop and ask directions. They can only follow the paths you set out for them, and as such, running a successful kingdom comes down to figuring out how to lay out the proper configuration of paths that will take each Flan by the resource you want, to the place you want, without them getting stuck. It'll take a lot of careful planning to get things running smoothly, and once you add things like cranes into the mix, which allow you to transfer goods a certain way along paths, it becomes even more important to lay out your landscape efficiently. Don't worry, you'll unlock more things to build with as you play! To defeat the dark forces in each game, you have to deliver certain goods to certain altars, building Fire Towers to melt the snow so you can build your way forward. You'll be working with other players who also have their own kingdoms to run and are trying to do the same things you are. As a result, you'll all be on the same field working towards the same goals, so feel free to peep on someone else's progress for hints and tips on how to optimize your own. Since there is rare "loot" (building materials) to win for defeating bosses and minibosses, you'll definitely want to work together! Analysis: Leap Day is, in a nutshell, exactly the type of free social multiplayer game we need more of. It's casual, it looks great, it's easy to pick up, but most importantly, it's also far more clever and involved than almost any other game of this type out there. It's one thing for a game to just keep you busy and entertained for a few minutes, but quite another to actually engage you and make you think, and Leap Day deserves some serious props for trying to do both when so few others even bother. It manages to be both approachable and simple in a way that will drag in new players of all experience levels, yet still unexpectedly challenging in a way that will keep fans of titles like Manufactoria happily busy for hours. And then they went and made it really, really cute too, the fiends! 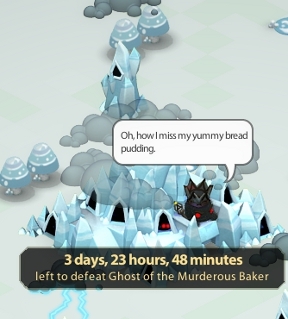 As of this writing Leap Day is currently in Beta, which means there are still a few kinks to be ironed out, like messages not vanishing when you click them and other minor bugs. It's also not the sort of game for players who don't like planning, since just plopping down paths and structures without taking stock of your surroundings won't really get you anywhere. Especially when the cost for everything from roads to houses increases with each purchase. Further, the game's tutorial is only helpful as far as grasping the basics go, and newcomers to this sort of puzzle/strategy hybrid will be lured in by the stellar visual appeal only to be intimidated by both the pressure of real-time gameplay and mechanics only briefly touched upon in the instructions. You'll have to be willing to stink at it a little the first time, but this is where Leap Day's unobtrusive co-op functions can be a blessing. While you might be embarrassed to see someone's utopian society chugging along like clockwork beside your disorganised mess, it provides a great opportunity to learn by example and observation. You're working together, after all, not competitively, and once you get used to that you'll have a much easier time of things. The game does, of course, implement microtransactions, and while you can play for free as long as you want, the only way to start a new game is to either wait for your current one to finish or spend crowns to "produce a new heir". The problem with this is that currently, crowns can only be gotten by purchasing them with real world cash, putting the cost of getting a new heir at around ten bucks US. This isn't really a huge issue since everything you need to win can be earned in game with careful planning and strategy, but it would be nice if you could earn crowns on your own slowly over time to purchase some of the neat booster packs and new heirs. But if practice makes perfect, then the future is bright indeed for Leap Day. Stick with it and learn the ropes and you'll find it's as hard to put down as it is fun to watch. Perfectly casual and brilliantly clever, it's a wonderful example of how games can implement cooperative gameplay in a rewarding fashion. If you love puzzle games, then you'll definitely want to check this one out. The kingdom needs a hero, after all... and a city planner. Leap Day Walkthrough now available! This will all be covered in the tutorial. At the beginning of every Leap Day, a Flan will leave each house and walk forward along a road. At the end of every day, all the Flans will return to their homes. The sun at the upper left corner of the screen will move from left to right to show how much of the day is left. It is replaced by a moon at night. Flans will always go forward if possible. Flans will go right if going forward is not possible. Flans will go left if and only if there is no other way to go. A Flan will always pick up an item it passes by if it is not carrying something already. A Flan will always drop off an item as it passes a receptacle while carrying something. A receptacle can be an empty factory input slot, empty crane, or your Palace. A raw material can only be harvested a certain number of times per day from each source. During the night, the materials will regenerate. Taking an item to your Palace will earn you money. Items can be crafted in factories. A Small Factory will merge three items into one, a Large Factory will merge five items into one. After an item is crafted, it must be picked up by a Flan before a new item can be created. Crafted items are worth more than raw materials, and crafted items can also be put into factories to make even more valuable items. To view a list of the raw materials, what they create when combined, and how much each item is worth at your Palace, you can open the Recipedia by clicking the hammer at the bottom of the menu on the left. Your initial goal after starting a new game should be to get your income to be as high as possible. Your income (the amount of gold you make each Leap Day with your current configuration) is on the left side of the screen below the sun meter. Below your income is the total amount of gold you have available to spend. Rather than having your total gold increase whenever something is dropped off at your Palace, it increases gradually at a rate determined by your income. The total amount you receive per Leap Day is the same as if it was done in chunks. Start with a Fire Tower to expand your territory in the direction of some resources, then place 2-3 Small Factories spread out around your Palace. Try to place them near resources so that Flans can deliver the materials quickly. 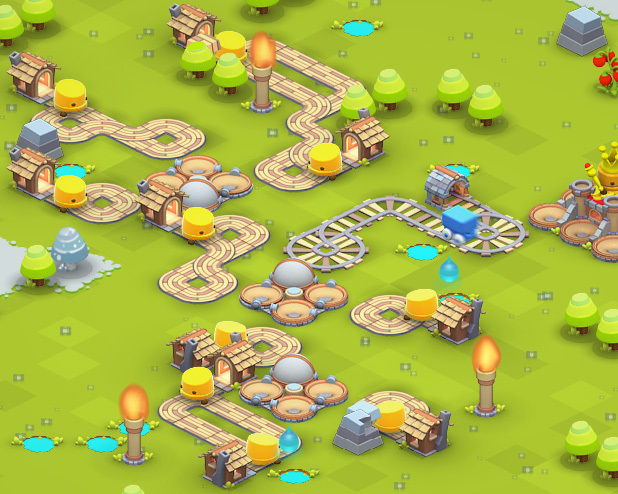 Place some roads and houses to harvest the materials and supply the input slots of the factory. Using two or three short tracks instead of one long one will give you more control over which materials end up in each slot of the factory. Here is an example of a very simple Small Factory that will produce 4 Polished Gems (Stone + Water + ?) per Leap Day. Set up a separate track to pick up the crafted item and drop it off at the Palace, and make sure that the Flan doesn't pass by a factory input slot after picking up the output. Having an individual track for each factory can be a viable option, but sometimes it is cheaper to have a circular track that goes around your Palace, picking up factory outputs and dropping them off for gold. The best choice depends on the distribution of your factories. Here is an example of two Small Factories with a circular track delivering the outputs. Cranes can be used to transfer items from one track to another. One side of the crane acts as a receptacle and will pick up an item from a Flan that passes by, then it will rotate 180 degrees and will give the item to the next empty-handed Flan that passes the other side. This can be very helpful in creating a series of small tracks, which is usually more efficient than one long one. The only problem is that they are considerably more expensive than roads, so placement is key. Keep in mind that only a Flan may harvest goods, sell an item at the Palace, and drop off or pick up items at a Factory. Cranes can also be used to hold undesirable items, if there are materials that you cannot avoid but do not want added to your factory. If a specific track is fairly long and cannot be shortened, building an extra house or two will increase the tracks productivity. 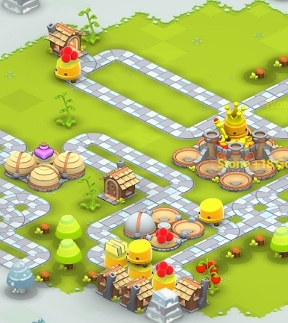 Stone Paths may also be used instead of Wood Paths, which will increase the movement speed of the Flans at the cost of some extra gold. You will receive Stone Paths as a gift once you have collected enough total gold: it should be attainable in your first game. A Flan must be able to move to pick up and drop off goods, so make sure you have enough room for each track to loop or continue past the drop off point. Because you can sell any roads or structures that you have placed for 100% of their value, you can try out any number of different configurations without wasting money. Experiment with your design to see what generates you the most income. Resources can be collected a certain number of times per day, depending on the resource type. Trees give 1 Wood, the berry bushes give 2 Food, the stone deposits and ponds give 4 Stone and 4 Water respectively. Keep this in mind when planning your factory paths and try to balance out the number of resources that can reach each factory and factory slot. Once you have earned some money and feel comfortable supplying and unloading Small Factories, you will want to build another Fire Tower or two and start planning a factory chain to increase your income further. If you combine 2 or more crafted items in a factory, you can create a new item that sells for more than the sum of its parts. This takes careful planning, however: you need to know what each factory will produce and make sure that the first crafted items arrive at the second factory correctly. 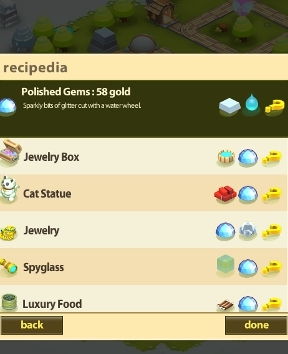 Take some time to peruse the Recipedia and figure out what you want to craft based on the resources you have available. Here is an example of a factory chain that produces four Spyglasses (Glass + Polished Gem + ?) per Leap Day. The ? can be any item, Water is used in the example. The Glass (Stone + Water + Wood) is made in the upper factory and the Polished Gems (Stone + Water + ?) are made in the lower factory. The items are then moved to the factory in the middle and combined with Water to make the Spyglass. This chain makes 1224 gold per Leap Day. Play with your configuration until you feel your income is as high as possible. If you get a factory chain set up right, it should earn you close to 1000 or more gold per Leap Day. If you have space and resources available, you can set up another factory chain. If not, you may need to take some time to let your money accumulate so you can save up for more Fire Towers. As you expand, you will see Palaces and structures built by other players. You can build a Telephone on their territory to talk to them, and if your borders touch you can use cranes to exchange items, potentially giving you both access to items that would be otherwise impossible to obtain. The end goal of Leap Day is to defeat the main boss of the map before the timer runs out, which usually takes 3 to 4 real-time days. To defeat a boss, you must first expand your territory with Fire Towers to the ice caves that house him. Surrounding the caves will be seven Ice Altars, and at the top of each Ice Altar will be an item, usually an item that is difficult to craft. In harder difficulties, the items will be craftable only using Large Factories. Ice Altars act as a receptacle for the item shown, accepting it in return for money like your Palace, but only once per Leap Day. If all the Ice Altars receive their item in one day, they will melt and the boss will be destroyed. Hopefully you will not be the only player trying to defeat the boss: if other players are working on destroying the boss as well, you can divide up the Ice Altars and will only have to worry about one or two Altars. Use the Telephone to communicate with your allies and plan the attack. If you are working alone, you will have to surround the cave and melt the Ice Altars all by yourself, which is much more difficult. Gems are required to create items required by some bosses. There are nine types of gems, but all gem sources appear the same until someone expands to them. Each player will only have access to one kind of gem per game: if you uncover Emeralds from your first gem source, all gems you uncover in that game will be Emeralds. In order to craft items that use gems, like a Ring (Gem 1 + Gem 2 + ?) or a Necklace (Gem 1 + Gem 2 + Gem 3), unique types of gems are required for each slot. This means you must trade with other players to get different kinds of gems. This can be done by placing a crane on the border between your territories. Once you expand your territory to the Altars, you can see what item they require and start planning your final factory layout. The strategy from this point on is circumstantial, depending entirely on the terrain, the items demanded by the Altars, and the amount of help you get from other players. 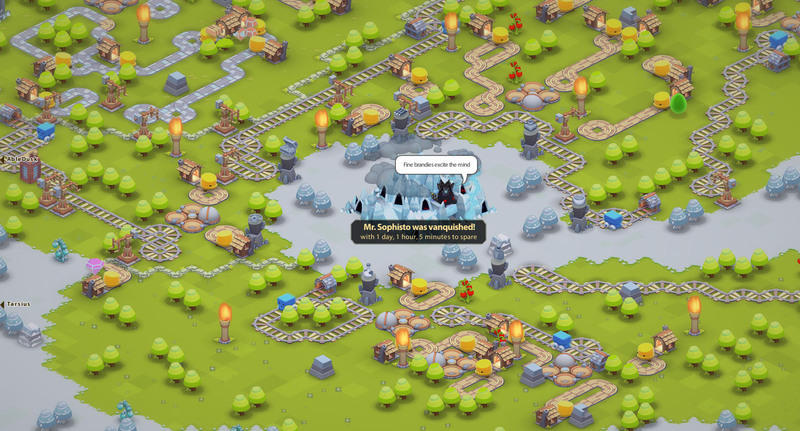 Here is an example of a defeated boss, complete with gem trading. If the boss of your map is defeated before the time runs out, you will receive a random gift that you can use in later games. You will receive a gift even if you did not help defeat the boss: everyone in the game when the boss is defeated gets the gift. The random gifts are small buildings that give you a passive bonus for as long as they are in play. These bonuses can vary from Gem Refining (all gems can be produce 4 gems per Leap Day instead of 3) to Brick Towers (20% increased radius for Fire Towers) to Water Purifying (30% increased gold value of all items containing water) and more. In addition to the random gift, the first three times you defeat a boss will award you with specific gifts. The first boss you defeat will give you Train Stations and Tracks. Train Stations will create Rail Cars the same way Houses create Flans. Rail Cars behave similarly to Flans but cannot travel on roads: they can only go on Tracks. Only Rail Cars can go on Tracks, Flans cannot. Unlike Flans, Rail Cars cannot pass each other going opposite directions on the same track. If you make a loop with Tracks, make sure all the Rail Cars go the same direction on it. If you are using a linear track with loops on each end, make sure the Rail Cars start close enough to each other to go around the loops together. Rail Cars move much faster than Flans, but they cannot harvest goods. They are great for moving goods around to and from factories, cranes, and your Palace. Tracks have a little more freedom in their placement than Roads for a couple reasons. For example, you do not have to worry about the track going by an undesirable resource because Rail Cars will only pick up items from cranes and factories. Also, since Roads and Tracks cannot be connected, a Track can run alongside a Road without disrupting the path of the Flans. When you first start a game, you probably will be unable to use Train Stations and Tracks effectively because of their high cost, but once you have earned some money you can use them to set up fast and compact factory chains. The second time you defeat a boss you will receive Large Factories. Large Factories are very similar to Small Factories, but they have 5 input slots instead of 3 and can craft much more valuable items. When using raw materials in Large Factory, your options are limited. You can create Mana (Water, Food, Wood, Stone, ?) which sells for 288 gold, but has no further combinations. You can also combine 5 of any of the four materials (5 wood, 5 stone, etc.) into an item that can sold or used to create even more expensive goods in Small and Large Factories. This is usually the best choice for the long run, because it means you can more easily upgrade to a factory chain later on. If you choose to combine 5 of the same type of resource, make sure you have plenty of that resource on your map. Try to avoid using water or food if you can: their combinations sell for much less than the wood and stone ones. If you can create 5 of these crafted items in a day, you can build a second Large Factory and chain them together. If you are making less than 5 in a day, you can just sell them individually or chain it with a Small Factory or two. Consult the Recipedia to find a good product that you can make. Well-placed Rail Cars are great for loading Large Factories because they let you have more control over which resources you collect and which you leave. This chain of two Large Factories first combines 5 Water into a Large Barrel, then a Rail Car moves it to the second factory. When 5 Large Barrels are loaded, it creates one Ice and sells it for 1125 gold. This configuration has two pairs of Large Factories. Each pair is capable of combining 25 Wood into 5 Black Oak, which then becomes one Fine Lumber, giving a total income of 6750. If Stone Roads were used instead of Wood Roads for the Flans, you could cut down on the number of houses required. However, you can only import 3 special buildings/roads beyond the defaults, unless you buy Crowns and use them to upgrade your inventory size. Because Large Factories, Train Stations, and Tracks were used, Stone Roads could not be imported without buying an extra inventory slot. The third time you defeat a boss you will receive an Ice Tomb Key. With the Ice Tomb Key, you can unlock mini-bosses in the game. Mini-bosses are defeated in the same way as the main bosses, except they have fewer Ice Altars and the items required are much easier to create. Once a mini-boss is defeated, the players that contributed to its destruction receive an instant gold reward. Unlike other items, the Ice Tomb Key is reusable and does not have a quantity. Defeating bosses after your first three will give you two random gifts instead of one. It's like multiplayer online Spacechem. It's... beautiful. I didn't think about it until then, but wow, it IS a lot like Spacechem. Having to do things as fast as possible with really finicky rules. There are all sorts of wacky, non-obvious ways you can change your gold/day score. For instance, I had built a loop taking resources to a factory. Because I was poor, I built it out of slow wood. Later, I decided to upgrade to stone - at which point I lost 200 gold/day. I had to go back and turn four segments back into wood. Presumably, changing the speed around the track changed what combination of ingredients got to the factory, changing what got produced, and making me less money. Rather hard to predict, though! I'm shocked that there are so few comments on this game. I'm having lots of fun with it. Lots of fun, but occasionally incredibly frustrating as there's a pond just where you need your flan to go (without picking up anything!). So often things are one square out! Korvar, in that case, you can use a crane to remove the resource your flan picks up. A bit expensive, but gets the job done. I wish more people had access to those wonderful guides such as cheeko's in here. I have not checked out the forums yet but I would assume there are growing communities! It would be a nice option to be able to preview the map before joining. There are often quitters and simply confused players who have flans wandering without any path to the Palace. I hope this game gets more support and attention because it really has big potential. This is a fascinating concept, but the frustration level would be dramatically improved if there were a way to remove or force-skip resources. I've been drafting and re-drafting my paths, and there are just TOO MANY TREES (and their wood) messing up anything I try to construct. There are ways to remove resources, though you won't have them on your first game. Trains become available after your first game. Trains are like workers, but they only interact with cranes and factories, so train tracks can be used to navigate crowded terrain while ignoring resource nodes. As you defeat minibosses (or if you buy booster packs) you may get totems that you can place for a small fee to make resource nodes stop giving items. You won't always have access to these, but they can be useful in the right situations. There are other good ways to prevent flan from picking up undesirable resources. You can place another path with a flan whose only purpose is to grab undesirable resources. 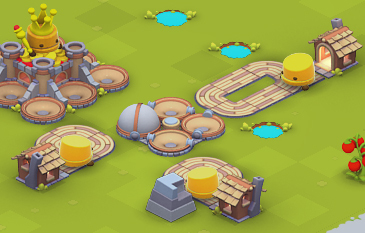 You can place factories or cranes so that a flan will deposit undesirable resources in them. You can also design a path so the flan picks up a desirable resource only after dropping off something else. As long as a flan is holding something, he will ignore other resources. Adjust your fire towers so that undesirable resources lie just beyond your border. A flan will not pick up frozen resources, or resources that belong to another player (unless they're in a factory or crane). Figuring out how work within the space you're given is a major challenge of the game! I've really taken a shine to this game over the last two weeks. It really is an absolute blast! You'll need to buy more inventory slots in order to get the most out of totems and other optional items (which costs real money) but that's a one-time cost, and you can play quite effectively on lower difficulties without ever doing so. Thanks for the tips! I've played with some of them; others are new. The space layout aspect of the challenge is great, and I like the concept. I'm just really frustrated by the sheer number of trees. I'm having trouble finding space to put factories that still allow a single road past all the spaces -- nevermind isolating loops! Cute graphics and great concept, akin to something like a state machine. I should comment that leap day has changed A LOT since the review; it might be time to update.